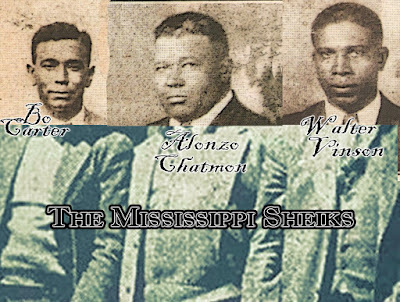 Mississippi's Delta blues music impelled the rise of the Mt. 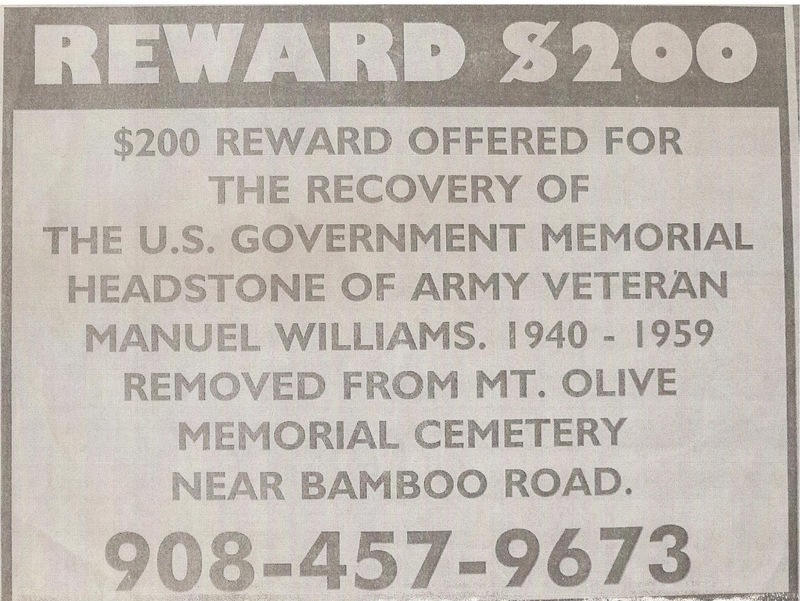 Zion Memorial Fund in 1989, but the need to preserve abandoned cemeteries and burial sites of musicians keeps us going. 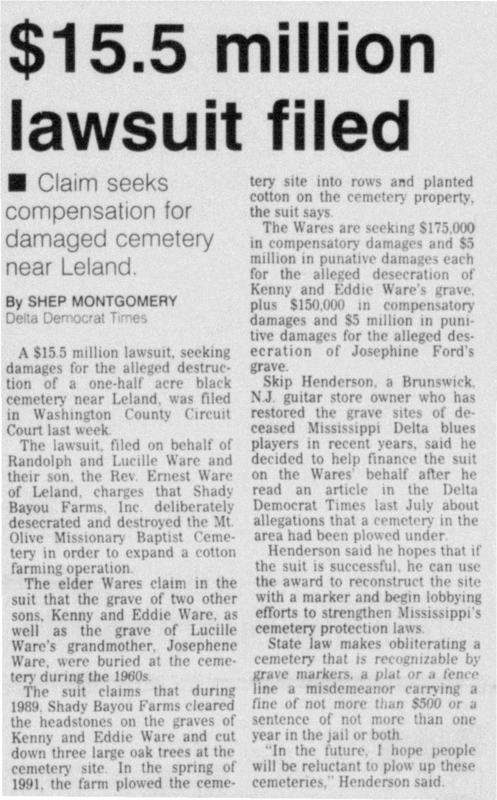 Like many folks still today visiting the Delta, we enjoy visiting the graves of blues artists, But unlike most folks now, we discovered that most of them were not marked and some border on the level of atrocity. When Cootchie Howard showed our founder the grave of Charley Patton, one of the most popular early blues guitarists and composers in the Delta, I am not ashamed to admit that he cried. Here was a man who served as a mentor to many other legends and his grave was twenty yards from a garbage dump. He deserved more respect than that. Yet, if the grave is unmarked. It's legal in Mississippi. And the law has not changed as of 2017. At the dedication of Patton's headstone, Rev. Ernest Ware of New Jerusalem Baptist Church in Holly Ridge mentioned Mt. Olive Cemetery where his two brothers and great-grandmother were buried. 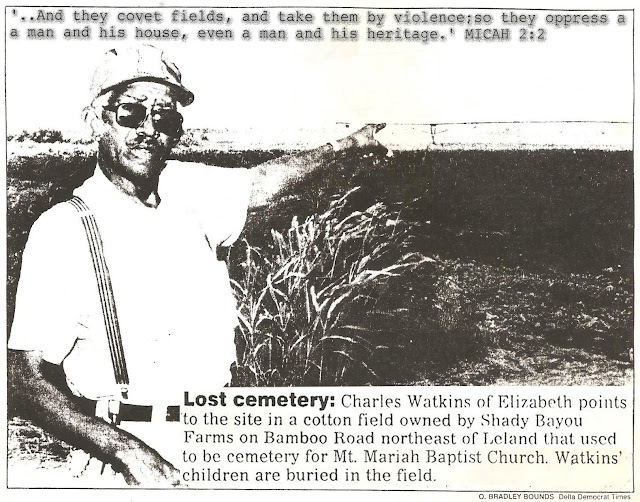 He told Henderson that farmers had plowed over the cemetery and planted cotton on the property. "As I looked into his eyes, I saw bitterness, defeat and helplessness," Henderson recalled, "I hope I never see anything like that in human eyes again." 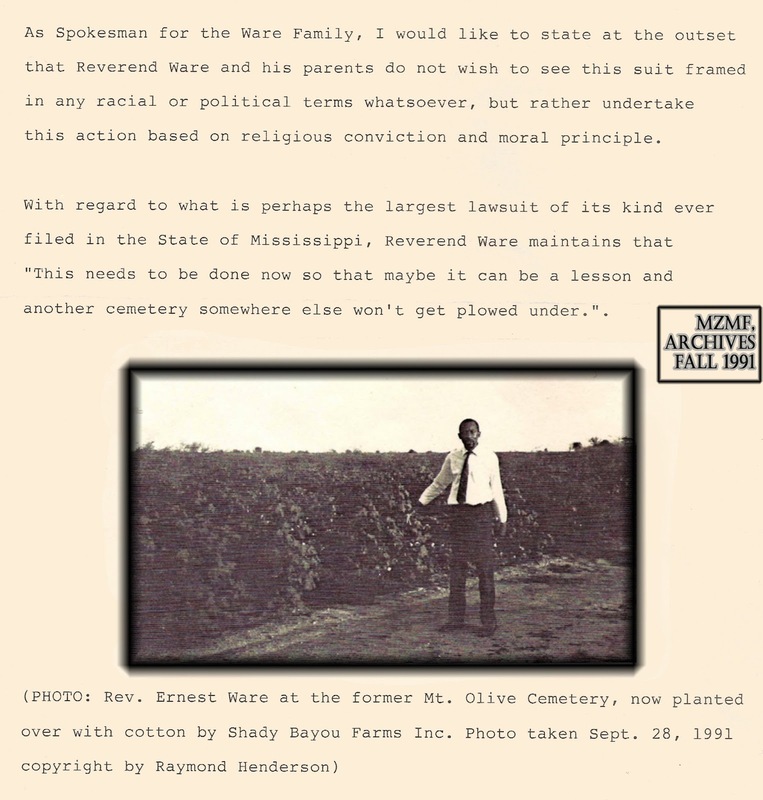 Says Ware: "As a minister, I know it's nothing but flesh in the graves. The soul is gone to another place. It's just the principle of the thing. These families want to go back and visit the graves of their loved ones. How would you feel just going back to a cotton field?" Henderson established the Mt. Zion Memorial Fund, a non-profit corporation that raises "money to support church communities in memorializing musical figures associated with their church or buried at their church." "Our whole premise in doing this is that the church cornmunity controls its property. If they control the property, they don't have to worry about others coming in to destroy cemeteries." 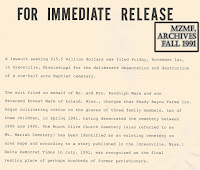 Sid Graves, director of the Delta Blues Museum in Clarksdale, thought the MZMF had been an inspiration to many Delta residents. The Mt. Zion Memorial Fund "spent a lot of time and money helping the people here [and] some churches have been able to retire their debts." Graves even joined together with Henderson in his efforts at "empowering the people of the Delta, while he and the churches are honoring the blues greats." Graves explained his support,. "I respect him and his efforts." Mississippi's chief archaeologist says the state has laws protecting gravesites, but it's up to local, county and state officials to enforce them. "There is always the misconception that the Department of Archives and History can do something about all grave desecrations," informed archaeologist Sam McGahey. "The fact is, we only have the authority to protect ancient graves — the graves of Native Americans, Hawaiians and Eskimos. Law enforcement officers must handle the other problems. Archives and History just doesn't have the time or manpower to go around and chase violators or check out every place a possible desecration occurs. "I think we would put an end to this problem if officials would only enforce the law." Assistant Attorney General Trey Bobbinger says state law makes obliterating a cemetery that is recognizable by grave markers, a plot, or fence line a misdemeanor carrying a fine of not more than $500 or a sentence of not more than one year in the county jail, or both. On the other hand, state law makes injuring, disfiguring, removing, excavating, damaging, digging into or destroying any "prehistoric or historic American Indian or aboriginal burial" a misdemeanor carrying a fine of not less than $500 and not more than $5,000 or a sentence of not more than 30 days or both. 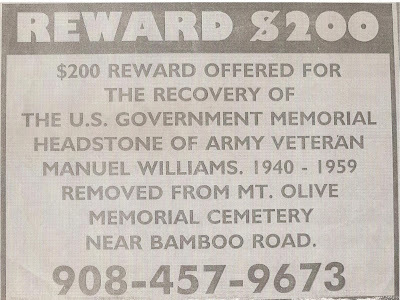 "The county may order restitution to pay the cost of damage to the grave," admits Bobbinger. "However, before a person can be prosecuted for desecration of a cemetery, he must have knowingly or willingly committed the offense." Rev. 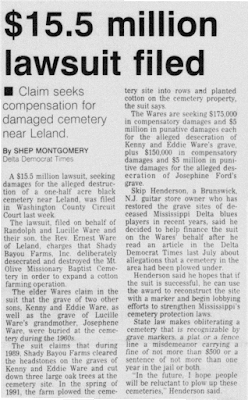 Earnest Ware of Leland, a plaintiff in a Washington County grave desecration lawsuit, exclaimed, "The law says destroying graves is a crime and those who do it should be penalized. Something has to be done. All I want is better laws, better protection for the dead. A little respect is not much to ask for." But look around. A little respect is the one thing that has never been. Since 1989, the Mt. 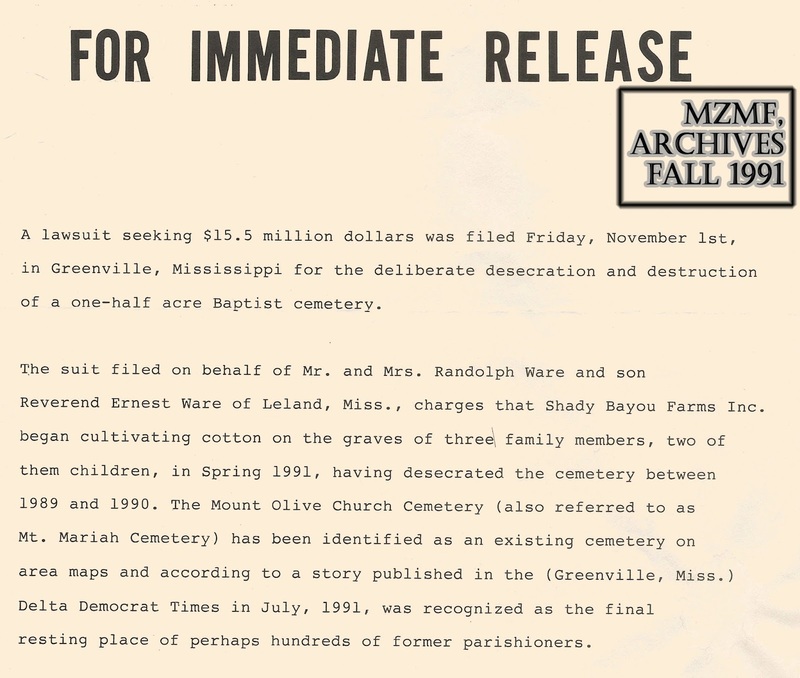 Zion Memorial Fund has assisted Delta residents in the preservation of area cemeteries. Skip Henderson took an interest in the preservation after discovering that many of the graves of legendary bluesmen were in danger of being lost. "Farmers are taking over much of the land in the Delta," he maintained, and "We don't want to continue to lose the rich heritage that is found in the Mississippi Delta. The thing I find ironic is black farm workers who are required to go around Indian mounds, but yet they plow through the graves of their own relatives. How can people let this happen'?" There is only so much the that can legally be done through the Mt. Zion Memorial Fund.